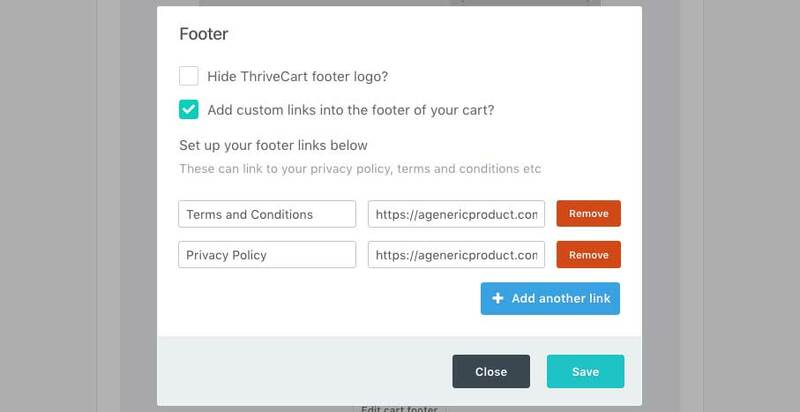 ThriveCart lets you easily add important links to your cart footer. To get started and adding links to your cart footer, you’ll need to edit your products settings and go to Checkout > Customize. At the bottom of this section will be the button Edit cart footer. Clicking this button will launch a modal window where you can enable the option to Add custom links into the footer of your cart. You can see it’s very easy to then add your links to your carts footer. Simply enter the descriptive text, then enter the URL that it links to. You can add/remove links to your footer with a click of a button. Note, Hide ThriveCart footer logo is available for users with the Client License upgrade. Once you’re happy with everything you can save your settings and your product. Your footer links will then show in your carts footer. If you have any questions, feel free to contact support directly.